Accu-Fab’s sustained success and well-established reputation is founded on principles of fairness and ethical conduct with our customers and employees. Our reputation for integrity and excellence requires careful observance of the spirit and letter of all applicable laws and regulations, as well as a scrupulous regard for the highest standards of conduct and personal integrity. Accu-Fab’s continuous growth depends upon our ability to earn and preserve the trust of our customers. When joining the Accu-Fab team, employees take on the duty of acting in a way that will merit the unceasing trust and confidence of the public, and our staff remains indebted to uphold this duty to Accu-Fab, its customers, suppliers, and shareholders throughout their employment. Accu-Fab will comply with all applicable laws and regulations and expects its directors, officers, and employees to conduct business in accordance with the letter, spirit, and intent of all relevant laws, refraining from any illegal, dishonest, or unethical conduct. Compliance with this policy of business ethics and conduct is the responsibility of every Accu-Fab employee. 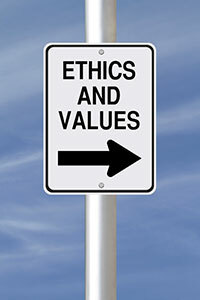 Disregarding or failing to comply with this standard of business ethics and conduct will mandate disciplinary actions. To preserve the safety and security of the plant to maintain the integrity of Accu-Fab, Inc. operations, it is the policy of Accu-Fab to verify whether a job applicant has a criminal record before making an employment offer. In addition, Accu-Fab embraces, supports, and enacts the following social accountability core values with regards to international human rights, labor standards, the environment, and anti-corruption. We support and respect the protection of human rights and are not complicit in human rights abuses. We uphold the freedom of association and recognize the rights for our employees to engage in collective bargaining. We will not participate in any form of forced or compulsory labor, and all employees hired will be the correct minimum legal hiring age according to state and federal laws. We are committed to protecting our environment and will take action or start initiatives to promote environmental responsibility and will actively seek environmentally-friendly technologies. Accu-Fab will work against corruption in all its forms, including extortion and bribery.